Cam York must have liked what he saw at Yost Ice Arena in October. 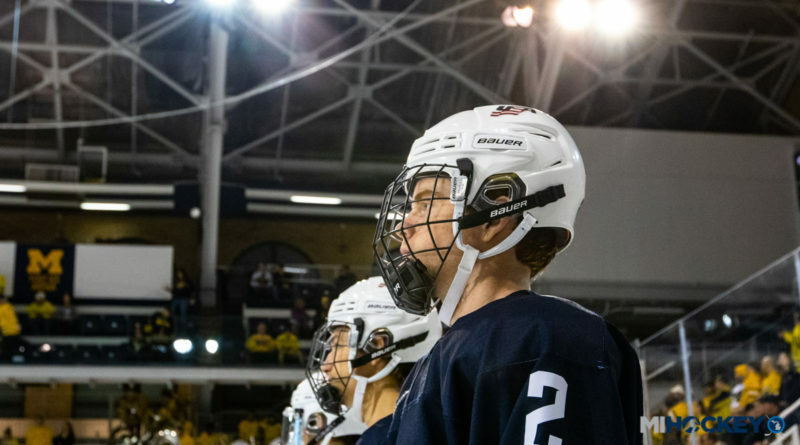 The USA Hockey’s National Team Development Program Under-18 Team defenseman has announced his commitment to the University of Michigan. York is a ‘A Skater’ on NHL Central Scouting’s most-recent list for the upcoming 2019 NHL Draft, meaning he is regarded as a potential first-round draft pick. York, a Shattuck St. Mary’s product, recorded one assist and a +1 rating in the NTDP’s victory over Michigan at Yost on Oct. 12. He said that game played a big part in his recruitment after de-committing from Boston College. A native of Anaheim Hills, Calif., York joins John Beecher as Team USA players committed to Michigan on the Under-18 Team roster. He was one of the members of the ’01 birth-year frequently called up to play with last year’s Under-18 Team, and York joined them for the trip to the 2018 IIHF Under-18 Men’s World Championship where Team USA won silver. York was named to the tournament all-star team after recording six assists – most of any defenseman at the prestigious event.